So, you've finally decided to take the plunge and go ‘all in’ on PC-based Virtual Reality. You've already done your homework and purchased a VR head-mounted display that meets your particular needs. So what's the next step to complete your VR system? You need a “ VR-capable” PC, of course! What Makes a PC “VR-Ready”? Two of the more popular VR headset makers, Oculus and HTC/Valve, have provided recommended minimum-required PC specifications (Oculus/HTC) that should guarantee at least a decent VR experience. Going below these specs might result in dropped frames, motion tracking lag, and other unpleasantries that might cause VR sickness in some people, and might end up ruining your overall VR experience. The main reason published VR minimum specs are so important is because they give VR developers something to target as a benchmark to test their apps and games against. 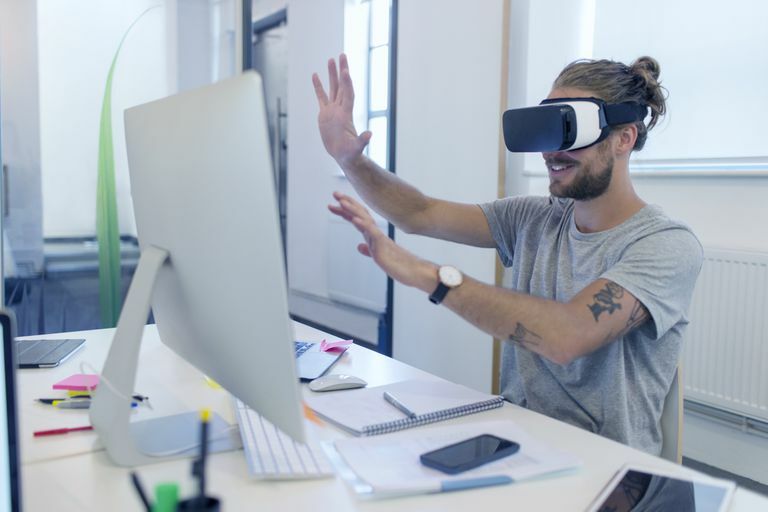 This helps to ensure that users who have PCs with at least the minimum specs for VR will have a good experience because the developer has configured their app or game to take advantage of the level of performance provided by the minimum specs. Anything the user has above those specs is just gravy. Users can use any extra horsepower they have above the minimum specs to allow for higher graphics detail settings, supersampling, anti-aliasing, etc. The best rule of thumb is to make sure your PC at least meets or exceeds the minimum requirements. If you want to do a little “future-proofing”, you’ll want to opt for a little bit beyond the minimum specs. The minimum PC processor spec for the more popular Head Mounted Displays (HMDs) is an Intel Core i5 4590 or an AMD FX 8350 or greater. If you can afford to, we recommend opting for something a bit more powerful such as an Intel Core i7 (or AMD equivalent). How much difference the processor makes in the overall VR experience is difficult to quantify, but in general, if you’re choosing between an i5 vs. an i7, the price difference between the two processors is probably not near as much as the price difference between higher-end graphics cards. A slower processor could also possibly hinder the performance of a higher-end graphics card which is another consideration. You don't want to spend a bunch of money on a fancy graphics card only to have your processor end up as the system’s bottleneck. Oculus recommends at least 8 GB, whereas HTC recommends 4 GB as the minimum. Again, when it comes to memory, you really can’t go wrong with purchasing more than the minimum requirement. Your system will take advantage of additional memory and it will generally improve the speed of just about every task your computer performs. This is probably the single most important factor in VR performance, as well as where things can get expensive. The minimum specs for VR-capable video cards are in a slight state of flux as new iterations of graphics cards entered the market shortly after the minimum specs were announced. Originally, the base requirement was at least a Nvidia GTX 970, or an AMD R9 290 or better. The Nvidia GTX 10-series was released shortly after the specs came out so now there are 1050’s, 1060’s, 1070’s, 1080’s, etc. Same case for AMD. This confusion leaves the buyer wondering which to choose, for example, is 1050 better than a 970? Is a 980 better than 1060? It can get confusing. Our advice is to go with the newer version of the card that was the minimum spec, and if graphics are really important to you, go at least one level higher than the minimum. Example, the GTX 970 was the original minimum spec, the 1070 is probably a safe bet for what the next “benchmark” will probably end up being. A 1080 costs quite a bit more than a 1070, but if you are wanting pro-level graphics and higher frame rates and want to add a little "future-proofing", then you might want to go for the 1080 if your budget allows. The display output is also important. Oculus requires HDMI 1.3 or better and HTC sets the bar at 1.4 or DisplayPort 1.2. Make sure the graphics card you purchase supports whichever HMD you end up choosing. The type of USB ports your system supports is also important for VR. For Oculus, you’re going to need a few USB 3.0 ports, and oddly, USB 2.0 ports are required as well. For the HTC Vive, only USB 2.0 is required. As for your operating system, you’re going to need at least Windows 7 SP1 (64-bit) or higher to join the VR party. You should also consider investing in an SSD drive for your OS drive if you can afford it, as it would likely improve VR app load times and speed up other tasks as well. As VR displays increase in resolution, feature, and complexity, expect VR minimum system requirements to increase as well in order to support the additional pixels and other advances. You may want to take this into consideration when purchasing your VR PC rig, so you won't be under-powered later down the road.